Learn about the season of advent and get ready for Christmas with this collection of fun worksheets. Here is a simple Advent Acrostic Poem printable which makes writing an acrostic poem much more fun! Use your child's forefinger to trace the letters of the word advent, then trace them again with a pen. It's a good way to learn the spelling, and they can colour in the lovely illustration too. Practise writing the word advent! This lovely worksheet will encourage children to learn to form the letters correctly and then have a go on their own on the last line. 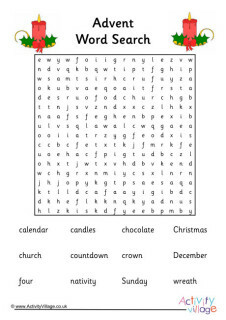 Can children trace the letters on our "advent" word tracing page? To use again you could laminate the page and use dry wipe markers. This printable worksheet will get the kids thinking about the real meaning of Advent, as well as why and how we celebrate it. Who made the first Advent Calendar? How is Advent celebrated around the world? How is Advent celebrated in your family? Kids can fill in the answer to these questions on this simple Advent worksheet. Use this lovely Advent wreath story paper to write about the meaning of advent and other Christmas traditions. Choose from two versions below: lined, or with handwriting lines. This fun story paper features a family going to church to celebrate Christmas. Use it to write about your experiences of visiting a church at Advent or Christmas, or for a creative story!